Gatun Lake is the site of several local guide companies that operate to take tourists on Jungle Day Tours throughout the rain forests surrounding the Panama Canal and Gatun Lake region. Gatun Lake is one of the world’s most famous lakes, as it was the largest in the world for quite a long time. The lake essentially made the Panama Canal possible, as its waters support the operation of the locks. From the shores of the lake, Jungle Day Tours embark and lead visitors on a voyage of discovery. Visitors can enjoy looking at the ancient sailing routes that have been used for centuries all around the isthmus, long before the creation of the Panama Canal. You’ll also likely see huge ocean ships that are in transit. Jungle Day tours are best for those that wish to see an abundance of wildlife. 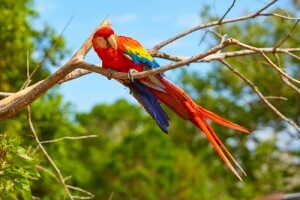 You’ll have the chance to snap photos of exotic Panamanian birds, monkeys, sloths, iguanas and even crocodiles. Some even allow kayak rentals and swimming in some areas. Fishing is always a popular Jungle Day tour activity, as Peacock Bass are abundant in Gatun Lake, although they are not considered a fish native to our region of Panama (they were introduced accidentally by a businessman vacationing in Casco Viejo). Let the tropical rainforest awaken your soul and enjoy Panama Jungle Day tours. Think of having a delicious, native style lunch with an abundance of local refreshments awaiting you while you are on your tour. Sip a cool drink and lounge in a nearby hammock while you wait on the boats to bring you back to Casco Viejo and Magnolia Inn.